Mexico City may not be the first place you think of when you hanker for steak tartare. But the best I have ever had is at a cantina called El Portal, at Calle Chiapas #174, almost at the corner of Medellín, in the Colonia Roma. It is a version laden with condiments, among them garlic, anchovies, mustard, lemon and capers. 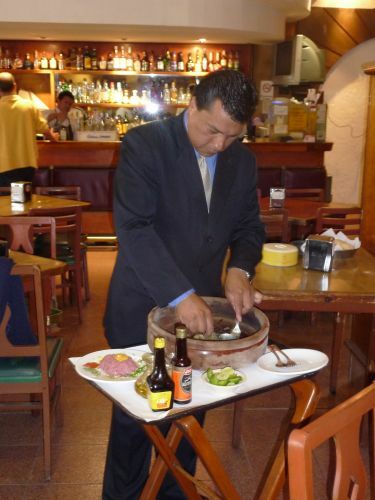 And you must ask for it to be prepared by Rubén, the captain of the waiters, pictured above, at work. Here is the finished version. El Portal has a full bar, and a couple of decent Spanish red wines to accompany the red meat. There is also a very good free-of-charge botana to go with your drinks (although the tartare, at 100 pesos, strikes me as a bargain). El Portal is generally a tranquil cantina. The other day, however, one of its patrons thought it would be amusing to show us his impersonation of a "look-Ma-no-hands," no-fisted drinker.